The Mission Valley League’s seemingly never-ending quest for respect got bolstered in a big way last Friday night. The league’s three high school football teams all advanced to the second round of the CIF-Southern Section Mid-Valley Division playoffs. No other local league can boast the same feat. For the Mission Valley players and coaches, it’s just more evidence they can point to for proof that the league’s bad rap is undeserved. “The first thing that came to my mind was respect for our league,” El Monte head coach Joel Sanchez said. “Everybody always puts us down and says that we only have one team that does well. This kind of sends a message to everyone else that the Mission Valley League is getting better. Sanchez’s Lions posted a thrilling 44-43 win over Montebello. South El Monte got past Covina, 31-24. And Arroyo, which needed to win in Week 10 just to finish third and make the playoffs, posted the biggest shocker of the night by slamming Almont League champion Bell Gardens with a 42-14 rout. Not bad for a league that most consider to be an afterthought. That may be slowly changing not only because of last week’s results, but also because of the record-breaking talents now playing in the league. Last season, Arroyo’s Steven Rivera put himself in the Southern Section’s top 10 career passing yards and career touchdown passes leaders. Rivera went on to be named the Tribune’s Player of the Year. This year, the record-breaking is coming from El Monte quarterback Brandon Martinez, who is now the Valley’s all-time single season passing yards leader after he broke Los Altos’ Mike Smith’s record of 3,265 yards. Martinez is also tied with Bishop Amat’s Pat Haden and Los Altos’ Felipe Aguilar for most touchdown passes in a season with 42. He can break the record this Friday against Paraclete. Martinez’s numbers this season are mind boggling. The senior has 3,951 yards and 42 touchdowns. He’s also run for 719 yards and eight scores. As nice as last week’s results were, it’s a long shot that any of the Mission Valley teams will be around after Friday night. All three are in very difficult situations. South El Monte plays at two-time defending division champ Monrovia, and the Eagles may be without quarterback Levi Wells, who got injured last week. Arroyo got a home game, but the Knights are hosting a defending state championship bowl game winner in Sierra Canyon. And El Monte’s reward for edging Montebello is a road trip to No. 1 seed Paraclete. But even if all three teams are done on Friday night, Arroyo head coach Jim Singiser feels that plenty has already been proven. “I’m thinking about having a practice on Thanksgiving whether we advance or not because I feel like the kids deserve it,” Singiser said with a chuckle. “It’s the first time it’s happened in the 20 years I’ve been at Arroyo. We’ve never had three teams advance. It’s a neat deal. If you’re looking for a reason as to why the league had such success in the opening round, a good place to start would be the nonleague schedule of all three teams. Arroyo routed co-Hacienda League champion Rowland, but also took its lumps against Los Altos and La Puente. El Monte played Gladstone (10-1) and fell in four overtimes. But the Lions did beat Bell Gardens and Covina. 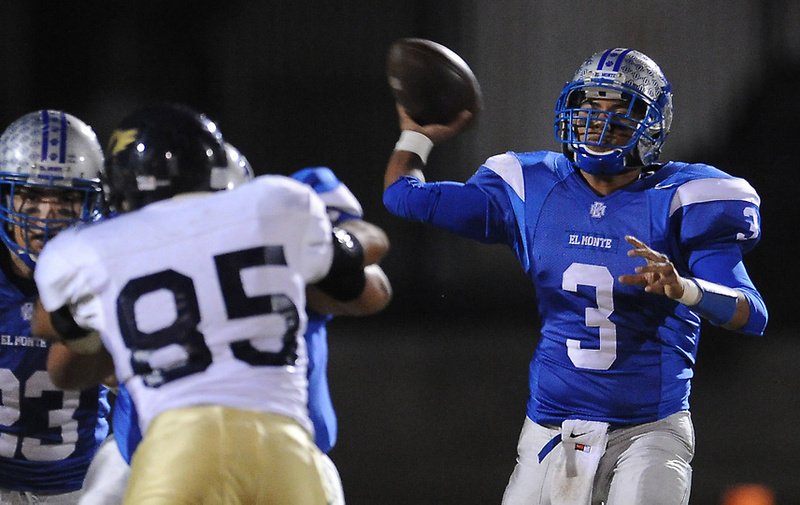 South El Monte cut its teeth against playoff teams Montebello, Northview and San Marino. The Eagles lost all three games, but beside Monrovia, nobody has given San Marino (10-1) a better game this season. Strangely, the Mission Valley League petitioned the Southern Section last spring to leave the Mid-Valley Division and be moved to the Northwest Division along with former Mid-Valley inhabitants the Montview and Olympic leagues. But the league was shot down and kept in the Mid-Valley. “My issue with the Mid-Valley wasn’t the Mid-Valley Division as it was,” Singiser said. “I liked having the Montview and Olympic leagues in it. I wanted to stay in that division. And our league as a whole wanted to stay in that division. All 3 making it to the 2nd Round is Great…but the road ends here. I think SEM is the toughest of them All. Monrovia should be in for a nice little game Friday. SEM plays really hard. Good football this weekend.